Last fall, the Centers for Medicare & Medicaid Services (CMS) released its final rule implementing the Medicare Access and CHIP Reauthorization Act of 2015 (MACRA). The final rule provides Medicare incentives to reward quality and value—not volume—through the use of alternative payment models. The business of balancing the checkbook with compassion is one of the most important aspects of being a practice manager. There are several strategies that managers can employ to work with their employees to understand them better, which can benefit their staffs and increase the value of their practices. 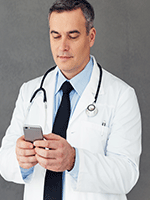 In May 2016, The Joint Commission altered its stance on text messaging, stating it was permissible for physicians and licensed practitioners to text orders regarding patient care, treatments, or services to hospitals or other healthcare settings--as long as it is done through a secure platform. With notable changes in Medicare underway, the American Medical Association (AMA) has unveiled a series of online tools to help physicians comply with the new Quality Payment Plan under the Medicare Access and CHIP Reauthorization Act of 2015 (MACRA) that will go into effect in 2017. It is no surprise that physicians are at a disadvantage when it comes to personal financial management. Although physicians receive the best medical training in the world, they are not provided with the knowledge necessary to deal with the business realities of practicing medicine or their financial well-being. Washington, DC—The use of biosimilars offers great potential to reduce healthcare spending while expanding access to effective therapies for conditions such as rheumatoid arthritis. The numerous issues related to the development, regulation, reimbursement, and marketing of these agents were addressed by Candida Fratazzi, MD, President, BBCR Consulting, Cambridge, MA, at the 2016 Annual Meeting of the American College of Rheumatology.